ROCKDALE COUNTY, Ga. – Authorities are searching for an escaped inmate they say stole a work truck to get away. The Rockdale County Sheriff's Office says Timothy Ward was serving time for a string of crimes including car break-ins and credit card theft. Deputies say ward hopped into one of a white trucks during a work detail in Conyers and took off. The truck has a logo on the side that says Latex Construction had a red generator in the back. Ward was last seen wearing a white shirt and pink shorts. CONYERS, Ga. -- Three teens have been charged after a woman working security for a production company in Conyers was kidnapped, stuffed in her trunk and sexually assaulted at gunpoint. Two 15-year-old juveniles - Duwayne Fleeting and Jarius Shorter - and 17-year-old Justin Kohn were arrested Wednesday, after the victim's vehicle was recovered Tuesday at the Nancy Guinn Memorial Library in Conyers, Ga. The juveniles' names and photos were released by Conyers Police officials because, they said, the two are being charged as adults. CONYERS, Ga. -- Conyers police are seeking to identify two men they say kidnapping and sexually assaulted a security guard. According to authorities, a female security was working for a filming company around 11:30 p.m. Monday when she was approached by two men with their faces covered. The men forced the woman into her own vehicle's trunk. Police said they then drove her around for an unspecified amount of time before they forced her to withdraw money from a Bank of America ATM on West Avenue in Conyers. The suspects then drove the woman to Johnson Park and sexually assaulted her, according to police. CONYERS, Ga. -- A Conyers Police Corporal is on paid leave after his K9 partner was found dead in his patrol car. Police say officer Jerahmy Williams drove home sick in a take-home police car at the end of his overnight shift Thursday morning. Police say he neglected to take his K-9, who lived with Williams, out of the back of the car. 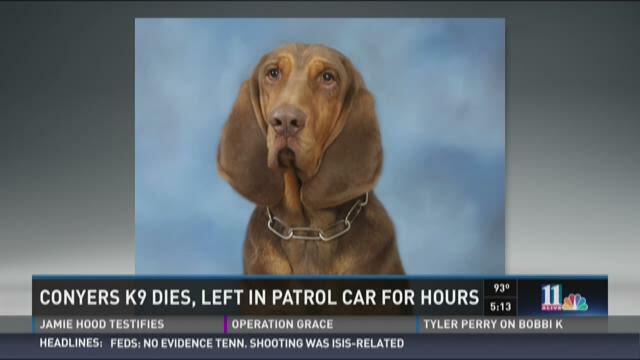 Police say the 5-year-old bloodhound named Zane died after spending seven hours in the back of Williams's patrol car Thursday as temperatures approached the 90s. Police say the distraught officer discovered the dog when he went to the car to report back to work Thursday night. ROCKDALE COUNTY, Ga. – Authorities say they seized more than a ton of marijuana in Rockdale County. The Rockdale County Sheriff's Office says they worked with the Conyers Police Department during the multi-month investigation. The team began surveillance at a warehouse on Old Covington Road after noticing what they called suspicious activity. On July 2, investigators suspected that a large shipment of drugs had been delivered to the warehouse. A uniformed Rockdale County Sheriff's Office deputy saw a van run off the road and made a traffic stop. Inside the van, deputies found 47 wrapped bundles of marijuana. Investigators then obtained a search warrant for the warehouse, where they found an addition 37 bundles of marijuana. ROCKDALE COUNTY, Ga. -- Police have canceled a Mattie's Call for a missing Rockdale County man who suffers from dementia. Hugh Doyle Pearson, 80, was last seen Tuesday at around 2:30 p.m., when he left his home in the 1900 block of Paces Landing Court. The Rockdale County Sheriff's Office said Pearson was found Wednesday in Athens. He was "slightly disoriented," but in good physical condition. CONYERS, Ga. -- Police say a Conyers teenager shot and killed a family dog after an argument with his mother. According to authorities, the 16-year-old boy got into a fight with his mother at a home on Hunting Creek Road. "It escalated to where the 16-year-old male actually threw the mother dog down the flight of stairs and then threatened to shoot and kill the other puppies," Kim Lucas of the Conyers Police Department. Investigators say the mother got out of the house with the younger children and called for help. When officers arrived, they found two puppies bleeding, hit by bullets. One died, the other, named Miracle, was only grazed on her paw.